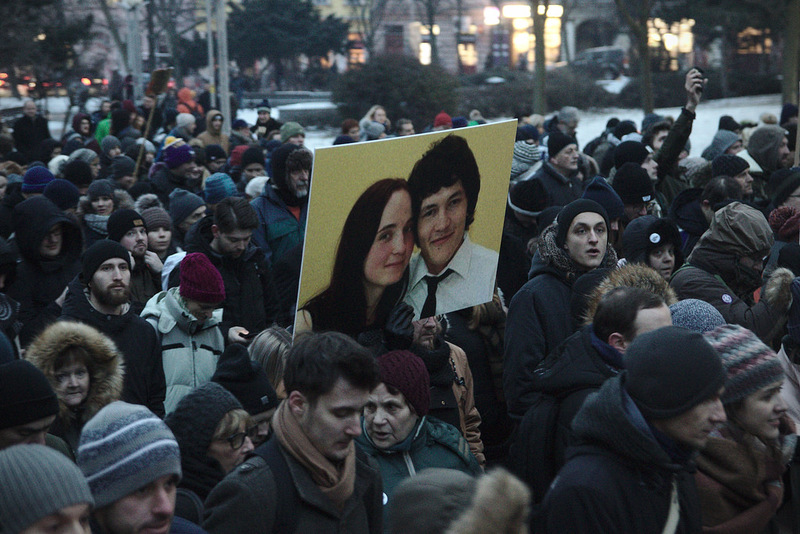 Demonstration in memory of murdered journalist Ján Kuciak and his fiancée Martina Kušnírová, Bratislava, March 2, 2018. MEPs have serious concerns over the fight against corruption and organised crime, impartiality of law enforcement and judicial independence in Malta and Slovakia. The Civil Liberties Committee adopted on Tuesday a draft resolution summarising the conclusions of the working group set up within the Civil Liberties Committee to monitor the situation of rule of law in the EU, particularly in Malta and Slovakia, following the murders of journalists Daphne Caruana Galizia and Ján Kuciak and his fiancée Martina Kušnírová. Following the murder of Daphne Caruana Galizia, MEPs of the Civil Liberties Committee and the Special committee on the Panama Papers travelled to Malta on 30 November-1 December 2017. Civil Liberties and Budgetary Control MEPs also visited Slovakia in March 2018, in the wake of the assassination of J. Kuciak and M. Kušnírová. The rule of law monitoring group headed by MEP Sophia in ‘t Veld (ALDE, NL) made a follow-up visit to both countries in November 2018. MEPs condemn the “continuous efforts of a growing number of EU member states’ governments to weaken the rule of law, the separation of powers and the independence of the judiciary”. They underline that the assassinations of Caruana Galizia in Malta and of Kuciak and Kušnírová in Slovakia, and the murder of journalist Viktoria Marinova in Bulgaria, had “a chilling effect on journalists” across the EU. The draft resolution was passed by the Civil Liberties Committee with 40 to 7 and 6 abstentions. It will be put to the vote by the full House in the March II plenary session (25-28 March) in Strasbourg. MEPs urge the Maltese government to set up a full and independent enquiry into the murder of Ms Caruana Galizia and demand that all libel cases brought by members of the government against her and her family be withdrawn. They denounce that the Prime Minister´s chief of staff and the current Minister of Tourism are “the only acting high-ranking government officials in any EU member state who were found to be beneficial owners of a legal entity revealed in the Panama Papers”. They insist that all suspected government links with opaque structures, such as Egrant and the “17 Black” company, deserve to be investigated. The text points to the many shortcomings in the rule of law in the country identified by the Venice Commission and urges the Maltese government and Parliament to implement all of the Commission’s recommendations without exception. Regarding the investor citizenship and residence schemes -which allow foreigners to gain residence or citizenship rights in Malta in exchange for a large investment-, MEPs want them terminated without delay, as these programmes pose “serious risks” to the fight against money laundering and “result in the actual sale of EU citizenship”. MEPs acknowledge the progress made in the investigation into the murder of Kuciak and Kušnírová, but insist it should continue both at national and international level. They also demand in-depth investigations into all the alleged cases of corruption and fraud brought up during their inquiries in the country. The resolution voices concern about the allegations of corruption, conflicts of interest, impunity and revolving doors in Slovakia’s circles of power. It also warns against the politicisation and lack of transparency in selection and appointment processes, such as for the position of Head of the Police. According to the EPP Group changes need to be made and now is the time to put the many words that members of Governments from both countries have made, into concrete actions. The citizens of both countries should have their minds put at rest that their authorities are truly acting in their interest. “We want the institutions in Malta to work and do their duty to protect the interests of all the Maltese people. We make a distinction between the Maltese authorities and the Maltese people and nation. We urge the Maltese Government to put its weight behind this Resolution and implement its call to actions immediately,” added Metsola. Notably, the Resolution calls on the Maltese authorities to set up an independent public inquiry into the murder of Daphne Caruana Galizia, to publish the full version of the Magistrate Aaron Bugeja Inquiry report, to stop selling passports with no genuine link to Malta, to investigate corruption and the link between the 17 Black company and Minister Konrad Mizzi and the Prime Minister’s Chief of Staff, as well as to take concrete action against the orchestrated hate campaign against the memory and family of Daphne Caruana Galizia. “We cannot allow journalists to be murdered for doing an honest job. I am glad that the European Parliament is fulfilling its duty to act thoroughly and actively in such cases. We demand a thorough investigation into the murders and all the suspicions that are associated with them. This is the only way to restore citizens’ trust in justice and the rule of the law. The Resolution calls on the Slovak authorities to ensure that journalists stop being attacked, to investigate all cases that Ján Kuciak was investigating, to prolong the Agreement of the Joint Investigation Team beyond April 2019, as well as to step up the fight against organised crime. The Resolution also calls for the swift adoption of transparent and objective rules and procedures for the selection of the new Slovak Police President this year, which should ensure independence and neutrality at the office,” said Ivan Štefanec MEP, Head of the Slovakian Delegation of the EPP Group. “In the last two years, journalists were killed in three EU member states. These murders shocked Europe. Investigative journalists play a vital role in our societies, exposing wrong doing and ensuring those in power are accountable. It is essential that those responsible for these horrific murders be brought to justice. It is important that both Malta and Slovakia are cooperating closely with Europol to investigate these crimes,” said S&D Group vice-president responsible for the report, Josef Weidenholzer. “It is important that the European Parliament continue to work closely on issues of democracy, the rule of law and fundamental rights in the next mandate. Sending ad-hoc delegations from the civil liberties, justice and home affairs committee can be an important tool to monitor the situation on the ground and send a clear message that Europe will act when fundamental rights are at stake in any EU country,” he added. “We need to be vigilant across Europe about protecting the rule of law and fighting against corruption. We urge national governments to stop blocking progress on Article 7 procedures against the Hungarian and Polish governments. The EU needs to show it can act when basic tenants of EU membership are under threat in a member state,” said S&D spokesperson for civil liberties, justice and home affairs Birgit Sippel. “It is ironic that MEPs from the centre-right EPP say they want real action to protect the rule of law in Europe but then also attempted to block any reference to the Hungarian and Polish governments in this report. These two governments are the ones facing procedures for consistent and systemic threats to the rule of law, not mentioning them shows the EPP group is not serious about protecting fundamental EU values but instead is trying to score political points,” Sippel concluded.